Dave Chisnall is St Helens’ only survivor in the quarter finals of the Unibet World Grand Prix which is being staged in Dublin. Chizzy thrashed five-times world champion Raymond van Barneveld 3-0 in a second round tie on Tuesday night and now meets world no.1 Michael van Gerwen for a place in the last four tomorrow (Thursday). 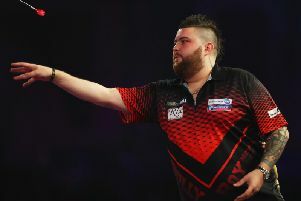 The former runner-up, who struck five 180s, missed six darts to win the second leg but eventually ypunished the Dutchman and cruised into the next round. “That wasn’t Raymond up there, but you’ve just got to beat the man in front of you,” said Chisnall. “It wasn’t pretty, I just kept making sure I beat Raymond’s score, but I’m happy with my night’s work and I’m pleased to be through to the quarter-finals of another TV event. “I’ve saved my best games for the TV this year which isn’t a bad thing. I’ve come close here once before, maybe this year I can go one better.